@ev & @Oprah...invading the cool kids space? Nah! I am coming up on my Two year anniversary on Twitter…which means I an old in Twot years. With Oprah (@Oprah) and Ashton Kutcher (@aplusk) stiring up the Twitter Pot, there has been a lot of Tweeting the past 5 days about how Twitter will now change. Twitter is now “main stream”, “the media” and “corporate America” have FINALLY caught on about this Twitter thing. Us early adopters (or as a very smart fellow Twitter friend called us – “the cool kids”) must move on and find the next “thing”. Remember, Twitter and social media in general is OPT IN! Phew! We don’t have to listen, pay attention, acknowledge, go around, delete, fast forward or act on anything we don’t want to. So let the spammers fall into the Twitter Cess pool and keep AutoDMing and AutoFollowing each other – they will all be rich in just minutes a day. I am not moving on and neither should you. Stick around and keep your circle. You don’t HAVE to do ANYTHING! You can still hang out in your moms basement in your underwear and Tweet away, we will still love you. 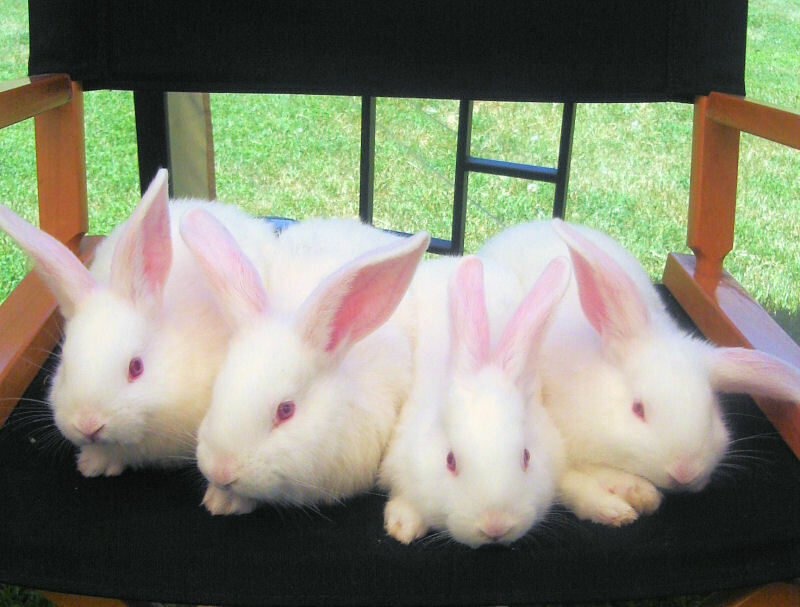 Just thought pictures of Fuzzy Bunnies would be appropriate for today after the 2 day discussion of Morals & Fuzzy Bunnies! I don’t get shocked easily & I am not a prude by any stretch of the word. I can swear like a sailor, scratch like a dog, but I look damn good in 3 inch heels and a smoking hot little black dress. But why do you feel the need to swear IN CAPS due to issues you are having w/technology…dude, it’s not like you are in a plane that is crashing! But I just saw this Tweet come through by @ScotteVest who lives in our great state of Idaho, but is not representing it well as a business owner at the moment. A few people have told me about this guy and what a hard worker he is. He does EVERYTHING on his own & doesn’t really like to hand things off. No worries, we are all controll freaks here and there – but now he needs help. UPDATE 4/16/09: Scott’s comment is below, thank you. I also received 2 other comments from Scott fans, but only posted one – I was actually thinking they were employees, but it looks like they are just fans. I Want to post the Tweets that came through to get your .02…is he sorry? Was I off base? Is that really his handle? The general consensious of the people writing the Twitter manuals on “how to” and “what is” appropriate in TwitterLand, might need to reconsider their follower/following number guidelines. Those guidelines currently recommend that you should have about an equal portion of follower to following or else you are considered a spammer (following more than are following you) or a celebrity (have more followers than following). Well, I think we can all be celebrities! Corporations & brands that want to really be a part of the social media uprise, need to LISTEN & ENGAGE! But, not in a spammy way. Be there for us when we cry out & have a need. Be there for us when we are talking about certain subjects. Be there when we have a request or question about YOUR PRODUCT (or a competitors!-but be nice). I responded that it was valuable info since I am in the hunt for an efficient webinar service. We pinged back & forth a few times, and then-it happened. @ooVooMarty chimed in and @’d me the following. @JenHarris09 saw comment on webex, give oovoo a look, www.oovoo.co…. He was either searching for key words and or competitors and found our conversation. He was not spammy, but very kind & gentle on suggesting that I check out oovoo. Me as the Company: For three months I was the Social Media Sales & Marketing Specialist for @TSheets. I was all over Twitter searching for mentions, recommendations & critiques of @Tsheets. I also searched keywords such as “time tracking”, “time tracker”, “time card” etc. Since 60% of the current customer base was tech, it was a good place to look. My results? Conversations with potential customers and engagement with those looking for help…in a NON-Spammy way of course. Our Twitter follower numbers never dropped because I was human & respected peoples time. I would read our customers blogs when they Tweeted them out and respond if I had something relevant to add (this is a WHOLE other blog on how a Social Media Marketer should engage in all platforms – stay tuned). My Tip of The Day? Use Search & Learn how to use “operators” well. Don’t be spammy, be human, be helpful. And Consumers, it is ok to have a skewed number of followers, if the man a caring company is listening in TwitterLand, it is better for all of us as consumers in the end.